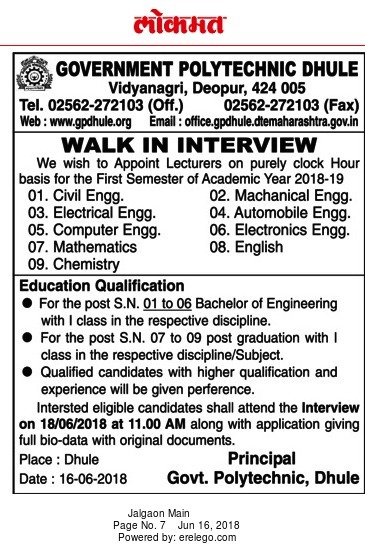 Government Polytechnic, Dhule has advertised in LOKMAT newspaper for the recruitment of Lecturers job vacancies. Interested and eligible job aspirants are requested to appear walk in on 18th June 2018. Check out further more details below. About College: Government Polytechnic Dhule was established in the year 1962. The campus of the institute is spread across the 52 acres of land with academic and administrative building, Workshop, Girls Hostels, Boys Hostels, Faculty and staff quarters, Play Ground and Multi-Purpose Hall with Guest House. The Institute is located at Vidyanagari, Deopur, Dhule on the Bay of Panjara River on the north side of Dhule, 4 km from central bus stand. In a well-planned city, the town planning of the city was designed by a notable engineer Sir Mokshagundam Visvesvaraya, awarded by Bharat Ratna.